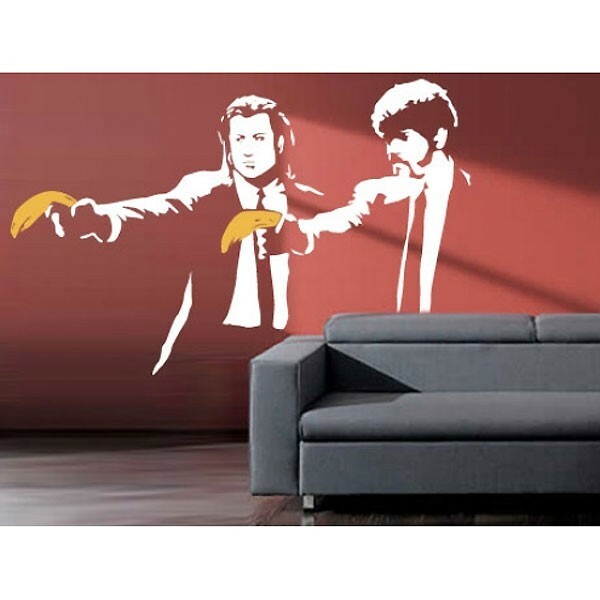 Decorate your wall with this humorous image of the iconic Pulp Fiction scene, cunningly edited with bananas instead of guns! This marvellous wall sticker is a replica of Banksy's graffiti art mural, for which the original was visible near Old Street Tube Station in London until 2007, when it was painted over. This iconic and memorable piece is great reminder of the fleeting nature of urban decay and is an ideal addition to any bedroom or living room. A perfect gift for those who love Banksy's work! Please note, unlike our other Banksy wall stickers, this one is predominantly white, so will need to be mounted on a darker wall in order to be suitably visible! Exactly as viewed & described on site.